Zelda models her Beta Biothane bridle from TwoHorseTack.com. Yes, I know here throat latch is on upside down! Last year, shortly after Zelda came to my barn, she broke my Micklem bridle. She did it while I was tacking her up by deciding to leave. She was slow and deliberate. She knew I couldn’t stop her (she’s large) and she kept going, stepped on the reins and the stitching broke. The bridle was fixable, but at that moment I decided that she wasn’t going to get another expensive leather bridle until she learned some manners. I found a nice looking Beta Biothane bridle from TwoHorseTack.com and bought it. I had no idea how much I would like it! Let’s see, let me count the ways that I have come to appreciate the benefits of a high quality synthetic bridle — because these are very nicely made, indeed. They really changed my mind about using synthetic tack. It isn’t expensive. 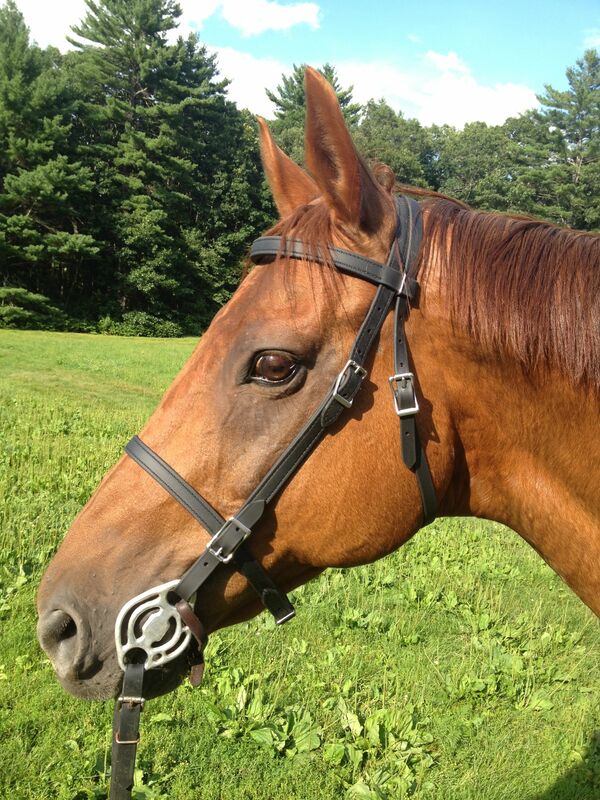 Zelda’s bridle was about $40 including shipping (it did not include reins). In fact, it’s such a good deal that I bought two more. Here’s a link to the bridle that they both wearing. Freedom modeling his Beta Biothane Bridle from Two Horse Tack. bridles, one for Freedom and one for Zelda. I keep them in my tack trunk in my trailer. I love having a spare that doesn’t break the bank and I know that sooner or later, having that spare will mean the difference between riding and not riding when I’ve shipped out somewhere. It isn’t cheap. This is a nicely made bridle that just happens to not be leather and which isn’t expensive. My horses look quite fine in their Two Horse Tack bridles. I’ve had a Wintec bridle in the past as a spare, but I like this one better. The material is softer and more supple — even after a year there are no cracks. The Beta Biothane is strong — but the buckles provide a “breaking point” to make it safe. They have buckle ends which I vastly prefer. They make it so much easier to swap out bits. Cleaning it is SO easy. Just dump it in a bucket of water while you’re cleaning the bit. I am lazy so this is a great benefit, especially in the summer when the horses come back sweaty and their tack is grimy. 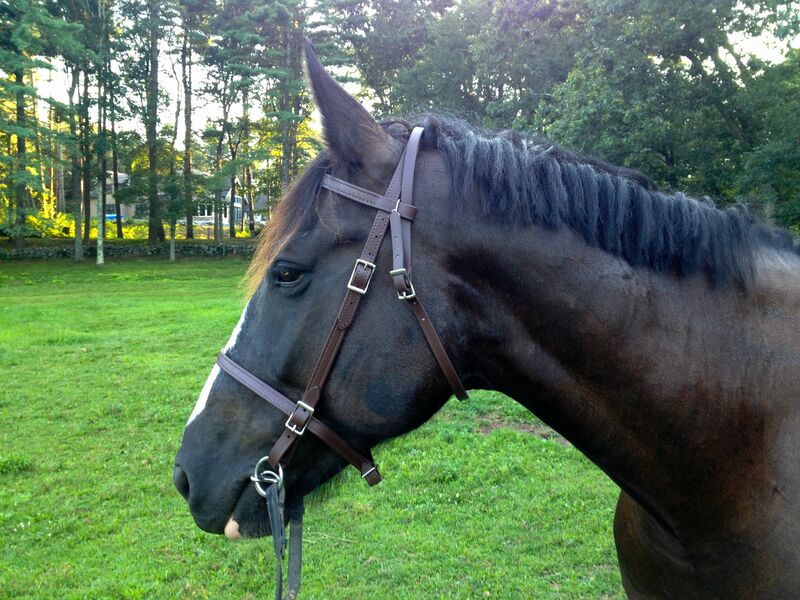 I no longer feel guilty about abusing my bridle and it always looks new. It doesn’t get dried out, brittle or moldy so it is carefree piece of tack. My tackroom tends to get damp in the summer or too dry when I use a humidifier so my leather tack requires a lot of care even when I’m not using it. Zelda’s bridle is more than a year old now and it looks brand new. I’m considering getting some of the more flashy options for the future. Zelda, in particular, would look might nice with some bright colors or some bling! I’m looking forward to trying some of their other products and am sorry that I now longer have a horse that goes bitless because their sidepull bridles look very nice.